A cruise operator cancelled a service and arranged to fly more than 2,200 passengers from the Bahamas to the US after a fire on one of its ships. 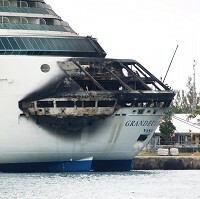 The Royal Caribbean vessel Grandeur of the Seas was damaged by the blaze but managed to maintain power and sail into Freeport on Monday. No one was injured in the incident, which highlights the importance of passengers having cruise insurance. It is not yet known what caused the fire. Passenger Andrea Sanders was on her first-ever cruise when the blaze took hold. Speaking to The Freeport News, she said she joined hundreds of others in sleeping on the deck as plumes of smoke came from the rear of the vessel. Photos reveal the cruise ship appears to be burned on several decks at the stern and some equipment suffered fire damage. The company apologised for the "unexpected development" and confirmed all guests and 796 crew members were safe and flights were being arranged to take the passengers back to the US. The National Transportation Safety Board has tweeted it will be working with the US Coast Guard to determine what happened on Grandeur of the Seas.